A beautifully furnished and fully equipped, quiet Spanish style villa with stunning features, sun terraces, pretty gardens, valley and partial sea views, situated close to award winning beaches and centrally located for Moraira, Calpe & Benissa. We offer a large, light and airy villa with a living area with a feature fire place and open beam style ceiling overlooking the pool with rustic BBQ and outside kitchen.TV with Free to view satellite TV (some of the free to view channels are, bbc1, itv1, itv2, e4, more4, citv, pop, tiny pop, pop girl, 501 etc) and DVD player. Also a master bedroom with en-suite shower room, second twin bedroom, family bathroom with extra large walk in shower, sink and toilet, dining room, fitted kitchen in traditional Spanish style with microwave, fridge freezer, dishwasher, oven, gas hob and water filter. There is also a washing machine and clothes line. Free WI-FI with this villa. The pool is reached through a number of steps, which may not be suitable for all, passing levels of beautiful gardens and terraces featuring colourful plants, flowers, ivy, palms, lemon and fig trees. Please Note: There are quite a few steps from the house to the pool area which may not be very obvious in the photographs. Moraira is a pretty fishing village, with strict building regulations in force, so there are no high rise buildings here. The fishermen still go out early in the morning to catch fresh fish to sell later that day at the traditional fish market. The people are renowned for their friendliness and with a coastline that stretches for 8km you will not be spoilt for a choice of bars or excellent restaurants. You can walk along the palm fringed seafront past the castle and numerous beaches, choose from rocks, pebbles or sand. The main sandy beach Ampolla is situated at the foot of the castle and is patrolled by lifeguards, there are excellent facilities here including children's play area, restaurants, bar and various water sports. El Portet Beach also has fine sand and crystal clear water, and has been presented with the Blue Flag Award for cleanliness. Calpe is a coastal town and resort situated approximately 45 minutes drive north of Alicante International Airport. Steeped in history and culture, the Old Town is especially interesting with museums, picturesque little streets and squares with many tapas bars and restaurants. Calpe is a friendly fishing village which sits close to the Rock of Ifach on a hill rising up from the last spurs of the sierra Bernia in the middle of Spanish Coata Blanca, a geographical marvel that provides access to the northernmost towns of Alicantes Marina district. It is an authentic tourist site, with a coastline boasting sandy beaches, cliff faces in some areas and an ancient salt mine, which all give the town a peculiar flavour of its own. Calpe is overlooked by the towering Penon de Ifach which juts out into the sea and rises to over 1000 ft. This is a very traditional spanish villa with a unique "real Spain" feel, it is spacious and there is sun on the pool all day. There are far reaching views, and an easy walk to the small quiet local beaches, (one has a nice liitle chirinquito for snacks and drinks). 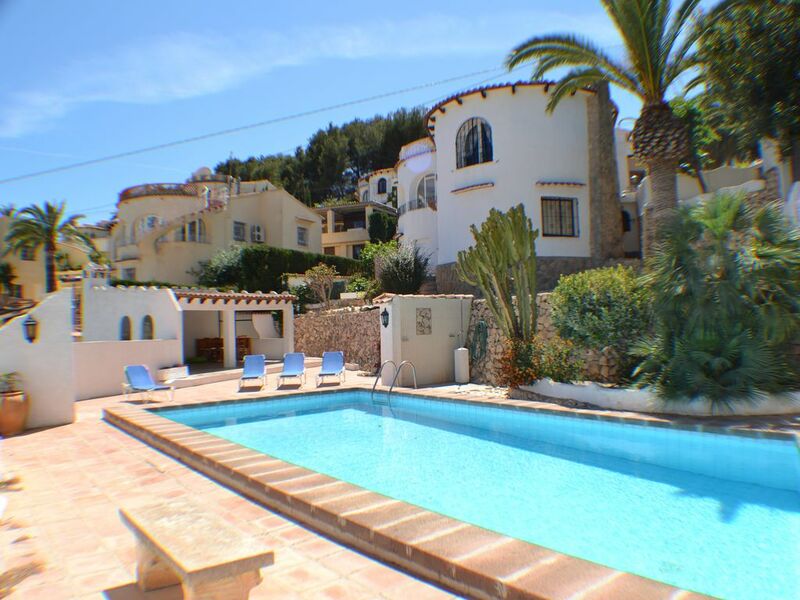 The house is midway between Calpe and Moraira so there are two choices of the larger busier holiday towns to visit, though there are plenty of restaurants, bars and shops along the coast road between them. There was plenty to do here on the days we could drag ourselves away from the pool. A small coastal town, Moraira is situated in the beautiful mountainous area of the Costa Blanca. The resort is conveniently placed between the airports of Alicante and Valencia (about 90km from each). However, the surrounding area has a quiet and relaxing atmosphere, with beautiful and.unspoiled scenery and many small villages to explore. There are also some larger resorts nearby that are easily reached by car that are well worth visiting: Javea, Calpe, Denia and Altea are all within 15km, while Benidorm is about 30km away. Moraira lies in a bay, on the South Eastern coast of Spain, between the larger resorts of Javea and Calpe, 80 km (1 hr) from Alicante and 110 km (1.5 hr) from Valencia airports with excellent motorway and coastal roads from both. The town has pleasantly grown from a small fishing village to an attractive holiday and retirement resort retaining its considerable charm that attracts visitors from all over Europe.